Edinburgh City Council has selected Mellor to help it meet their low emission vehicle needs. The Scottish Government has committed to the introduction of Low Emission Zones (LEZs) in Scotland’s four biggest cities between 2018 and 2020, and into all other Air Quality Management Areas by 2023. Pat Traynor, Fleet Manager at the Council, said: “The City of Edinburgh Council has had a long relationship with Mellor, which builds and designs vehicles to match the Council’s requirements to effectively provide services to the population of Edinburgh. “We took delivery of the 12 Orion LFs earlier this year. These vehicles are Euro VI compliant and feature 360-degree cameras for extra public safety and driver awareness. 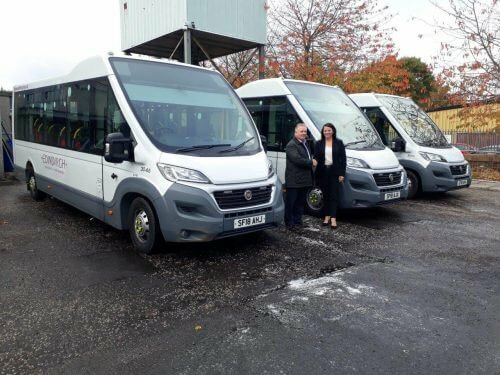 Lorna Miller, National Sales Manager for Mellor, added: “We are delighted that Edinburgh City Council has chosen Mellor for this fleet investment. Pat Traynor continued: “Safety is of paramount importance, and the enhanced features offered by the Orion, coupled with optional extras such as cyclist protection systems and hard disc recorders, will help to ensure the wellbeing of all those who share the roads with our vehicles.